These unlikely food pairings will make you want to stock up on cheese. Whether it's melted on top of vegetables or creamy cakes, cheese is one of the most versatile ingredients you'll find in your kitchen. From a simple sandwich to a main course. Find out the edible mishmashes you can work on with Arla Cheesy Spread, made with all natural ingredients, it's perfect to pair with the most simple kitchen staples. Arla Cheesy Spread is a real cheese spread from almost 90% fresh cow milk, rich in Calcium and Vitamin A. You won't be able to resist to whip up an instant dish to serve to your family. Yes, PB&J is a classic combo but why not try combining those fruit spreads hanging around your pantry with your favorite cheesy spread? Combining the two into an ooey-gooey grilled cheese, the pairing of fruit spreads and cheese is one that you'll quickly become hooked on. 1 Spread generous helpings of butter on slices of bread. 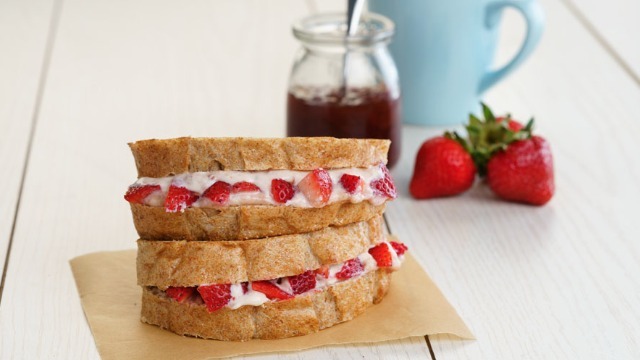 2 Mix Arla Cheesy Spread and the strawberry fruit jam and spread evenly over on easch side of buttered slices. 3 Sandwich the slices together and cut into triangles. 4 Heat a pan in medium heat and grill the bread until toasted on both sides. 5 Serve the sweet and salty snack with fresh tomato ketchup. An easy made creamy appetizer. 2 Clean and rinse the mussels, pat dry with paper towels. 3 In a small bowl combine the rest of the ingredients and mix well. 4 Lay the mussels on a baking tray lined with baking sheet or aluminium foil. 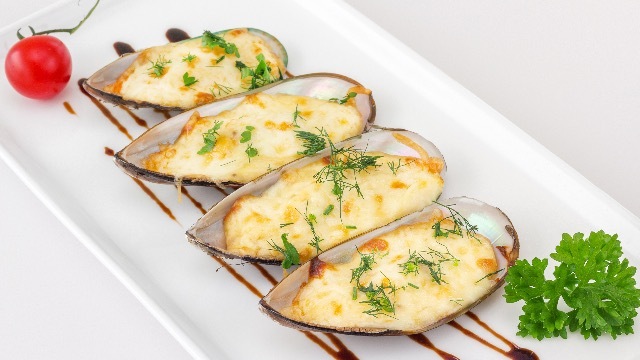 5 Top each mussel with ½ tablespoon of the cheese-mayo mix. 6 Bake the mussels for 20 minutes or until the surface becomes golden brown. A classic recipe you can whip out with milk, butter and cheese! 1 Preheat ramekins in a 400 degrees F oven with 1/4 tablespoons of butter. 2 Melt another set of 1/4 butter and flour over medium-high heat stir and cook constantly until it foams. 3 Remove the mixture from heat and beat in hot milk, then simmer over medium heat, stirring slowly until it thickens. 4 Remove from the heat and whisk in 1/4 teaspoon of cayenne and salt. 5 Whip the egg whites until stiff, shining peaks form. 6 Whisk 1/4 of the egg whites mixture into the milk to lighten it. 7 Fold delicately with the remaining egg whites, alternating it with spoonfuls of Arla Cheesy Spread into the mix. 8 Pour the souffle mixture into the prepared dish and put in the oven. 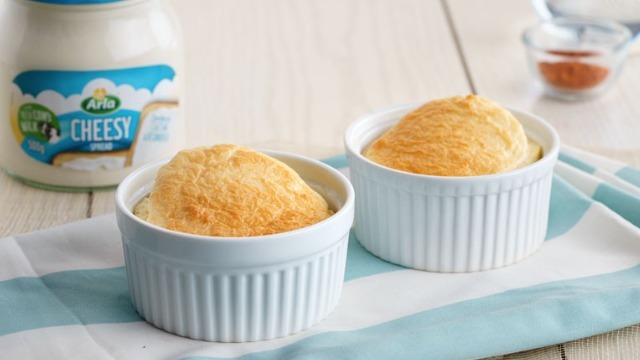 9 Reduce the heat and bake for about 20 - 30 minutes or until the souffle has puffed 1 or 2-inches above the rim and has browned on top.